performance – up to a point. 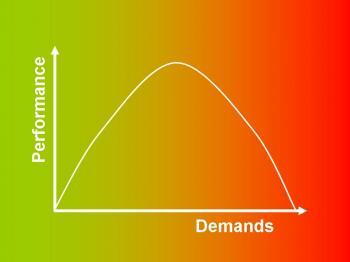 But when you continue to demand more of yourself, beyond the peak of the curve – your nerves get out of hand and your performance plummets. In my post on overcoming the fear of public speaking I suggested using principles from Cognitive Behavioral Therapy to help reduce your nervousness. CBT is based on the theory that your thoughts influence your emotions, which in turn influence your behavior. Notice the word “must” in there. “Must” implies an absolute demand which cannot be broken. The things we must have in life are air, water, food and shelter. If we’re about to lose one of those – it’s potentially a life or death situation – and your body will react with the fight or flight syndrome. So when you say “must” to yourself you’re signalling to your brain to activate the fight or flight response. That causes adrenalin and cortisol to be released into your body. Your heart pumps blood round your body faster, your muscles get ready for action, your digestive system shuts down. When you get nervous before speaking does your heart beat faster, are your hands shaky, do you get butterflies in your stomach? Those symptoms are a result of the activation of the fight of flight response. So using the word “Must” contributes to your nervousness. 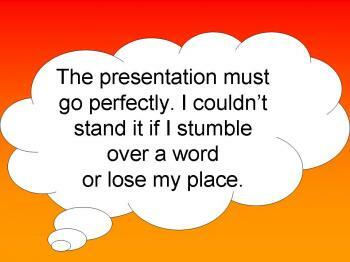 And it’s not true that your presentation must go perfectly – it’s not a matter of life and death. This thought is neither true or empowering. Having demolished the old must-based thought, the next step is to replace it with a new, more empowering thought. This thought lowers the demands you’re making of yourself. It turns the “must” into a goal. It acknowledges the reality that speaking does often involves some stumbles. 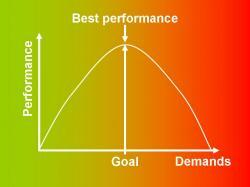 It still has you aiming for your best performance and makes it more likely that you will achieve it. In the next post, I’ll look at other “must” thoughts you might have about public speaking and presenting and how you can challenge and replace them with more useful and empowering thoughts. the sentence “it’s not a matter of life and death” reminds me that one of my best friends uses often the method “the worst case scenario”. He often lowers his goal and thinks: It must not go perfectly. I will be satisfied, if I can pass the basic ideas of this presetation to the people. And with this “the worst case scenario” method, he can always deliver a good presentation than he thought. That’s a great example of the benefits of accepting that there is no such thing as a perfect presentation. 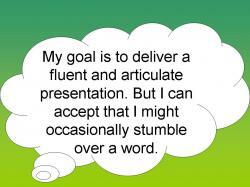 After my first few speeches I lamented that I forgot to say this or that. But I’ve overcome my delusion that I’ll ever deliver a flawless speech. Now I’m becoming more natural and engaging since I’ve stopped trying to follow a perfect script. Instead I’m just trying to have a good conversation with the audience. It’s not about the exact words that I say. It’s about the main message that they remember. I think that the transition from needing to be perfect and saying it just right towards simply getting your ideas across is a pivotal point in most people’s development as speakers. I love your site, I have never seen so much rational, clear advice in one place.